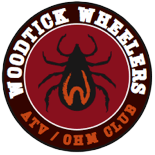 All club gear is available at meetings and rides, and by mail! New gear coming in 2018: women's tops, and caps, plus new colors of shirts and hoodies, and best-selling jackets, log flags and more! Ball caps! Ping golf visors! 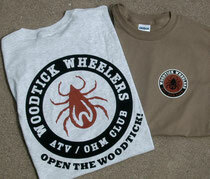 Short-sleeve and long-sleeve T-shirts! And more! 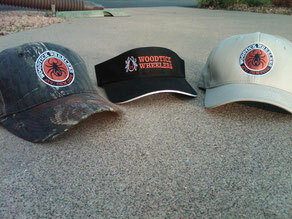 Contact us about our latest Woodtick Wheelers gear and wear it proudly. 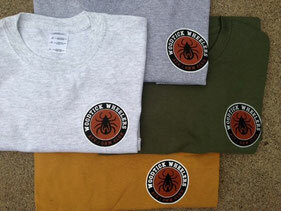 New this year: T-shirts with a chest pocket for your trail map or cell phone. See all the latest club gear at our club rides and meetings. Club T-shirts! Available in youth size and adult sizes M, L, XL, 2XL, 3XL. Colors: Ash, sport grey, military green, prairie dust. Can cuzies! 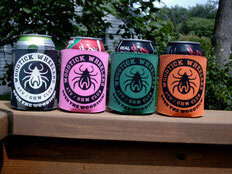 Great for keeping your favorite beverage cold and promoting the club. $3 each or 2 for $5.